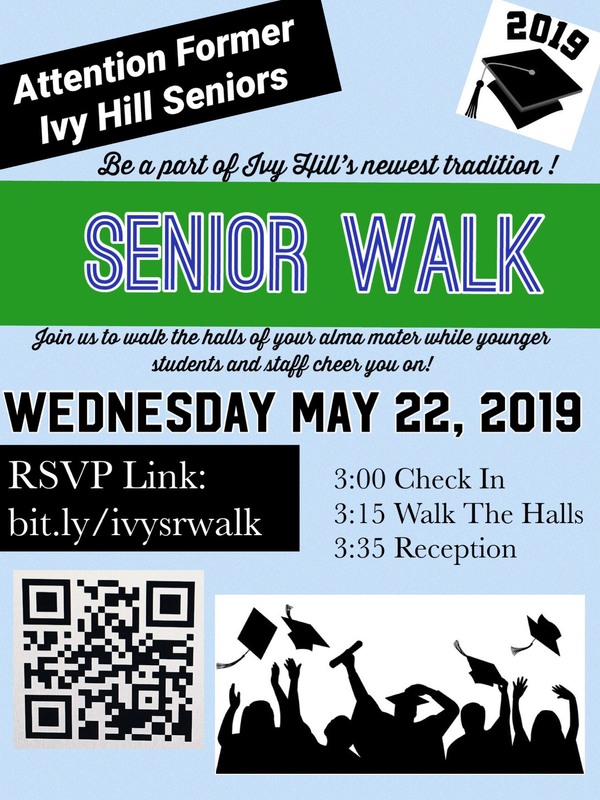 SENIOR WALK: Calling all Ivy Hill alumni who are graduating Seniors! Be a part of Ivy Hill’s newest tradition on May 22! Check out this flyer for more information. NOMINATING COMMITTEE: The following individuals are slated for Executive Board Offices for 2019-2020. Please mark your calendars for the May 15th PTA meeting, when the new Executive Board will be voted in. Nominations will also be accepted from the floor at the time of the election. Nominees must have agreed to take on the role (if elected) prior to their nomination. I-FIVES go to: Book Fair Committee (Joelle Vena, Stephanie Lazzari, Rekha Muruvinakombe-Adiga, Sherry Geer, Kelly Nixand Katie Hacias) and all of the volunteers for running such a great Book Fair! SAVE THE DATE: Our next PTA Meeting is Wednesday, May 15 @ 7pm. All parents are welcome! This is the last meeting of the year. We will be voting in our 2019-2020 Executive Board at the meeting and need at least 15 to vote in our new Board. Refreshments will be served and childcare is available. By ivypacket in Uncategorized on April 11, 2019 .